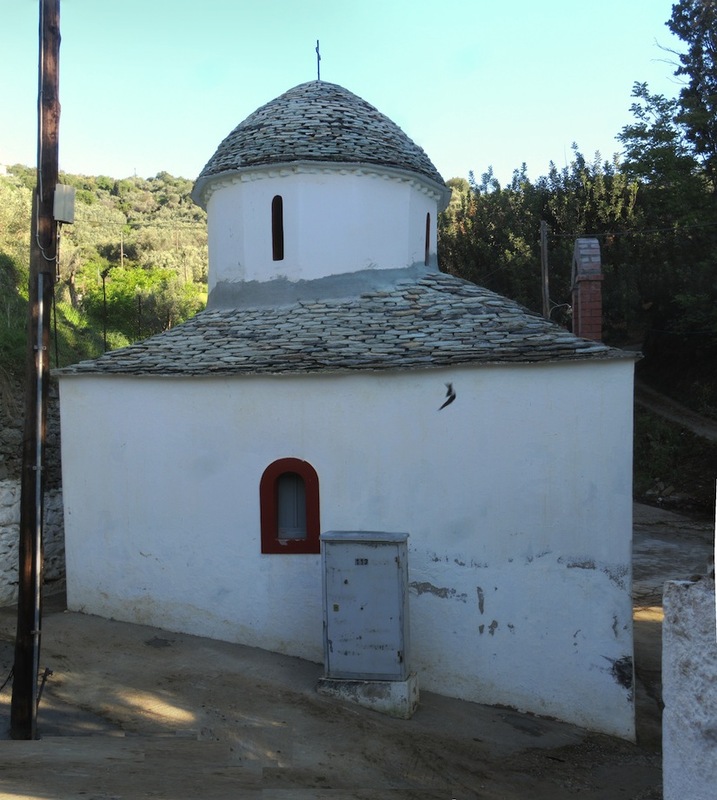 To paraphrase the 1958 Lieber/Stoller song by The Drifters, the Troulos (dome) of the little church of Agion Panton was leaking and needed work. 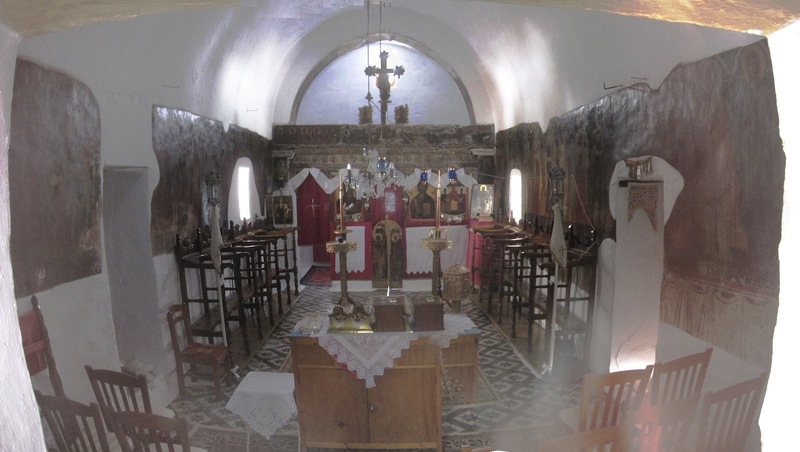 In fact, the church in Aloupi near the cemetery and the fountain needed new concrete and a full set of fresh plakas. The problem was not so much who could do the work, but whether the “mastoras” could adhere to, or better the original weird dome structure. The photo from two years ago shows the problem facing the roofer. The form of the old dome was neither a hemisphere nor a section of a perfect ellipse. 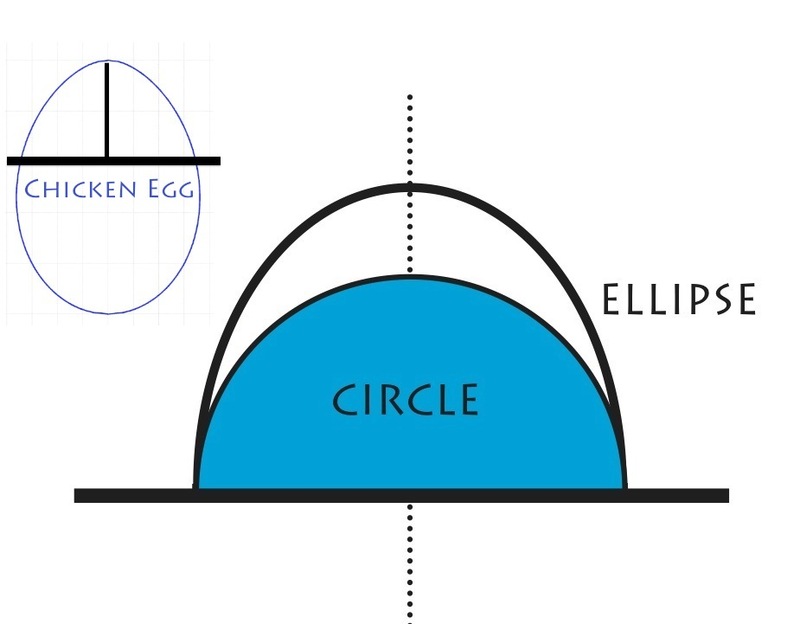 The form is more like the “sharp” end of a chicken’s egg. We tried to follow master builder Christos Ambelakias as he attempted to solve the problem. Probably the first step was thinking about the project long and hard, making calculations, and talking to other roofers about the work ahead. Next was to order materials and to build an elaborate scaffold to allow the easier movement of materials to the church roof. 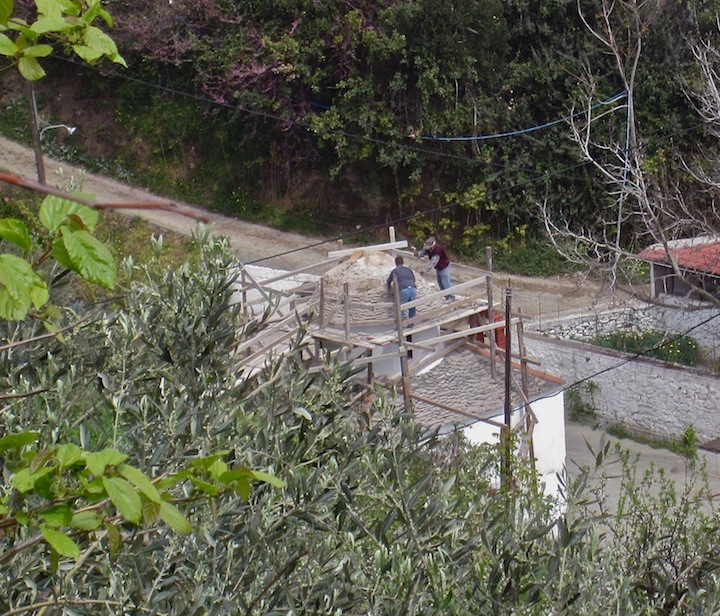 Then, the removal of the old plaka stones and the “laspi” that was securing the stones to the understructure. 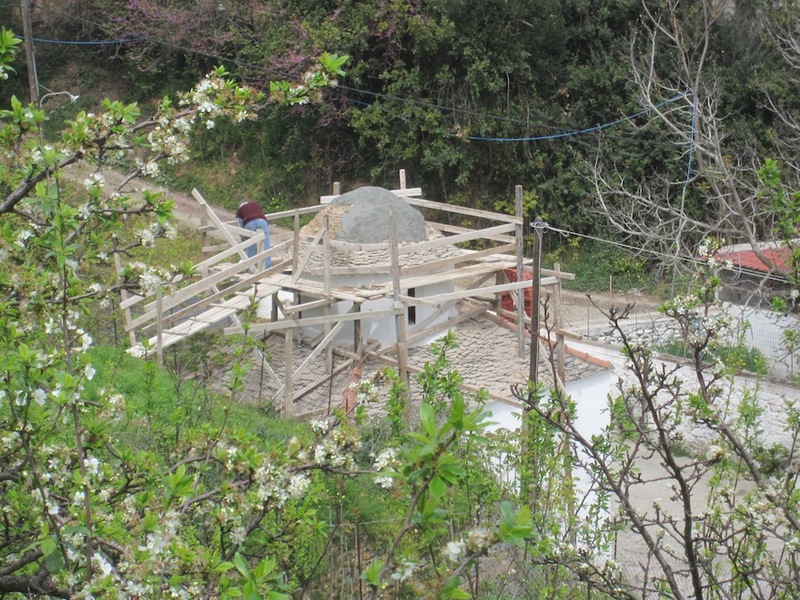 A new coat οf tsimentokovonia (fine concrete) to seal the dome and provide a base for new mortar. After the new mortar had set and had been covered for the night in case of rain, the construction of the new surface started with the application of a row of fresh stones around the base. 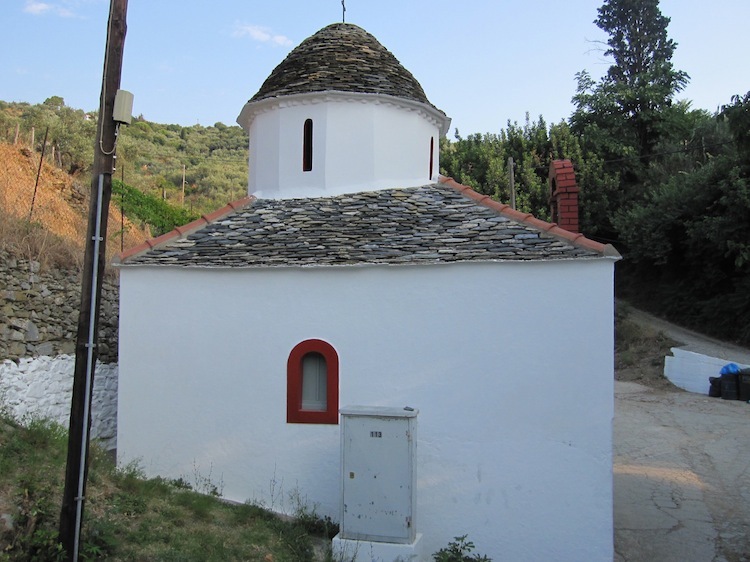 At some time Mr. Christos had made, from insulation foam board, a “form” (kaloupi) of the line of the dome that he wanted. We are not sure what calculations he used to design the “form” but it would be an essential tool in the rebuilding of the dome. 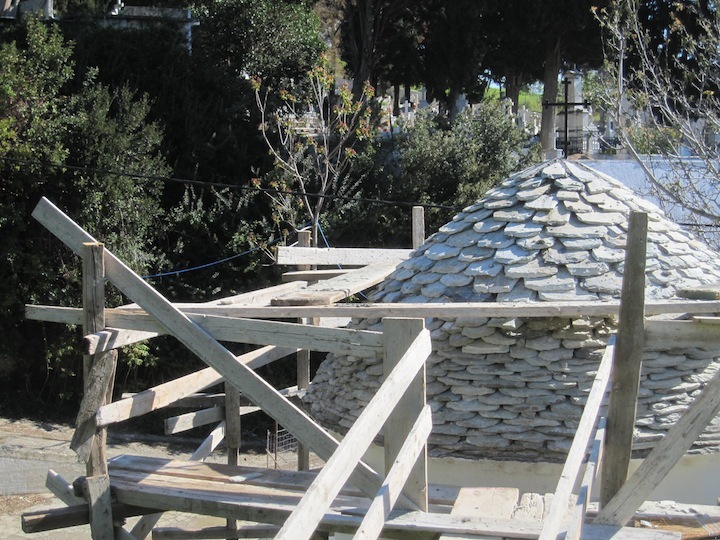 Working from bottom to top and using the form to guide him, Mr. Christos chipped and shaped the new stones with his stonemason’s hammer and applied them to the roof. This work continued for one week but did not include the builder’s strike last Wednesday. 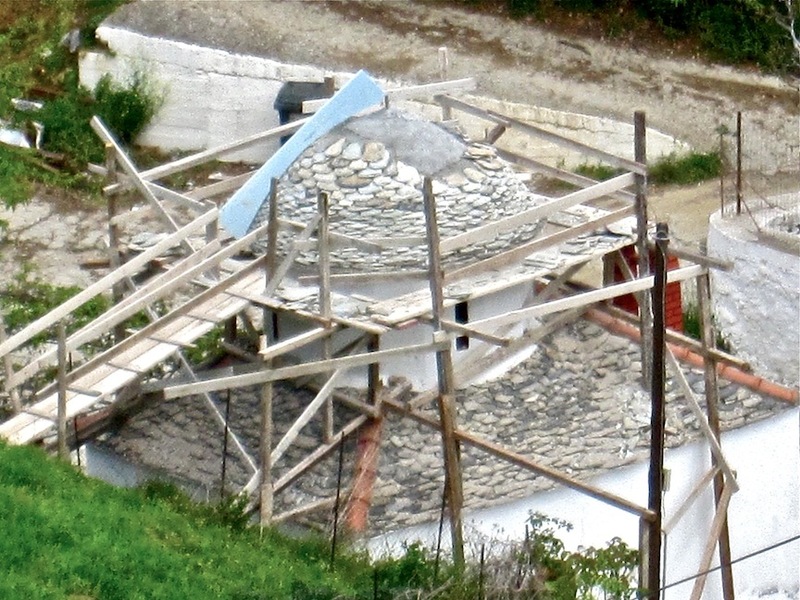 Finally, with all the stones in place, the crown was sealed with a final application of concrete. The stone work at Agion Panton is finished and the area cleaned up. 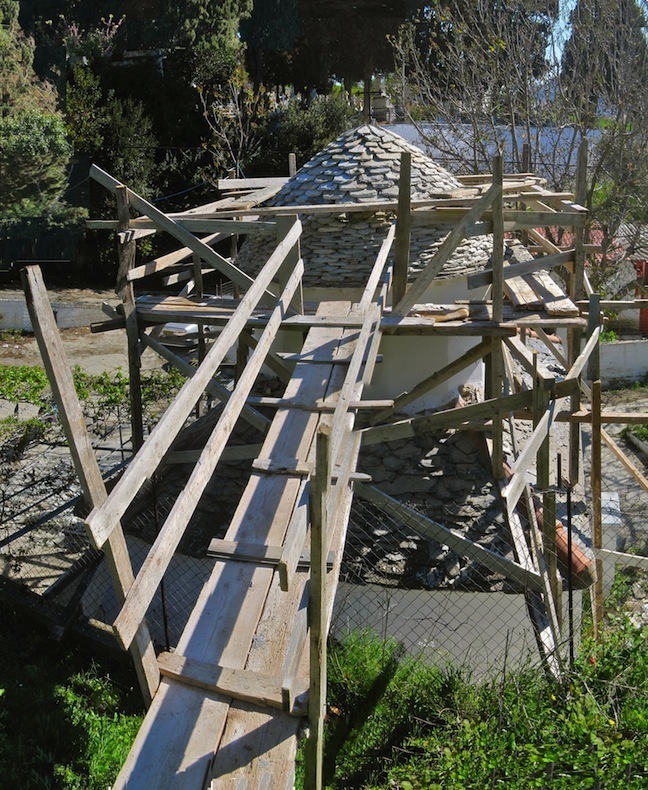 You can see from the photos that Mastoras Christos has eliminated the “keramidia” where the four sides of the roof meet. “Pio oraia, tora” the Mastora concluded. And the roof is more beautiful with new plakas applied seamlessly around the church. A new coat of whitewash awaits. Agion Panton Feast day Sunday June 15, 2014. Service in the morning. 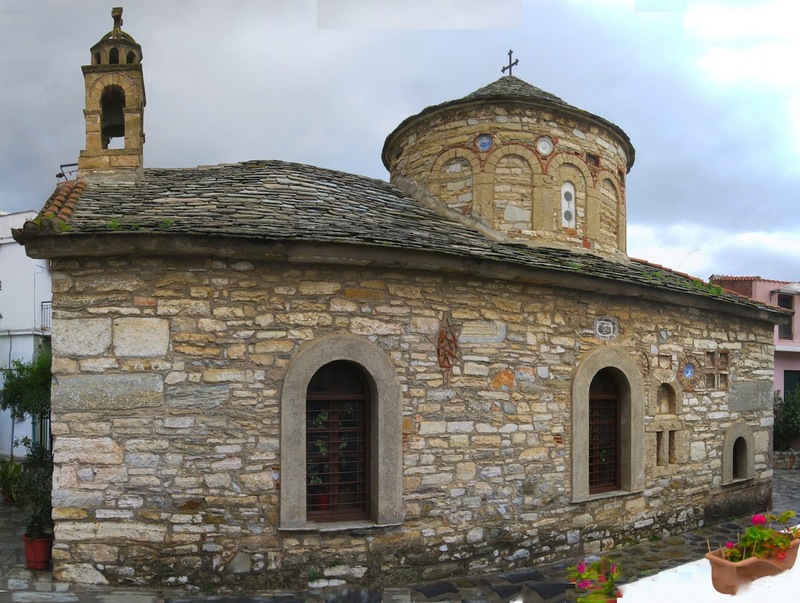 The church of the Holy Apostles is located on the Vrachos over looking the port. 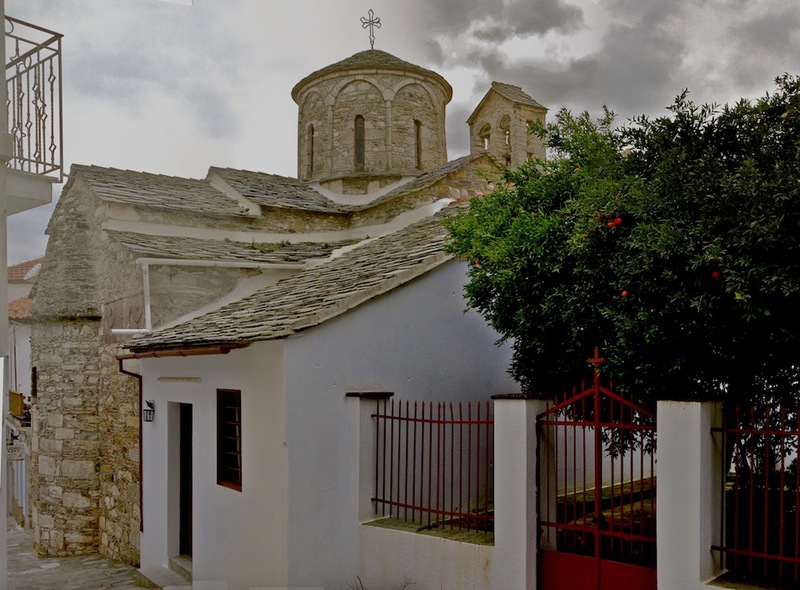 It was built in the 11th century by the Bishop Anastasios (who also built the older church at Episkopi). The church is on the site of a temple to Athena* (see* below). 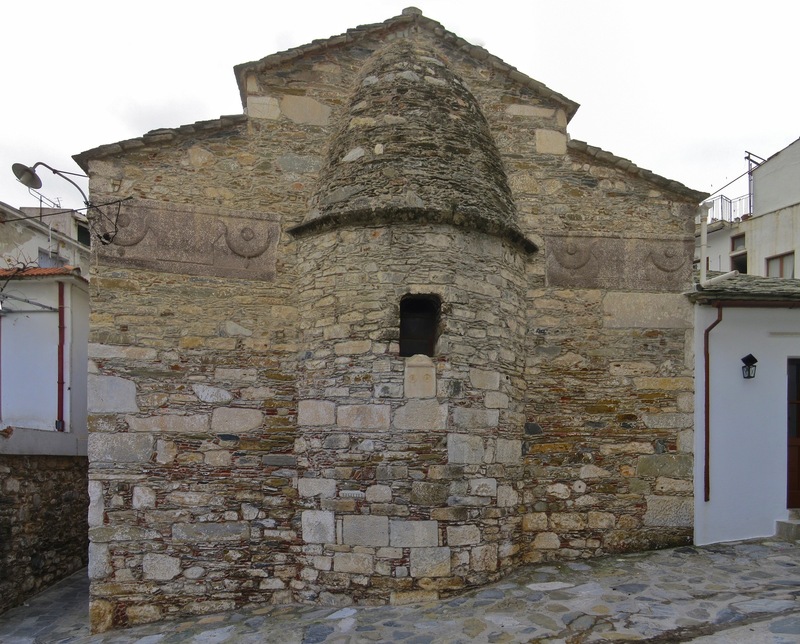 The structure of the church is a simple design, a rectangle of 12 x 5,4 meters with a simple ceramic tile roof. The plastered masonry of the exterior has no specifics, but the interior is fitted with some relics from the earlier building, such as the ancient inscription relating to the establishment the temple of Athena inside the North Entrance, some columns and a fountain, while many more are scattered in adjacent yard. On the east wall of the church (facing Palouki and the harbοr), are embedded five colorful painted tiles with the motif of (what look like) peacocks. Also in the SE corner of the temple there is a modern fountain. There are two doors, the main door being on the north side and a smaller entrance in the opposite wall. Inside the basilica, the vault has been enhanced by an arch the height in the temple. 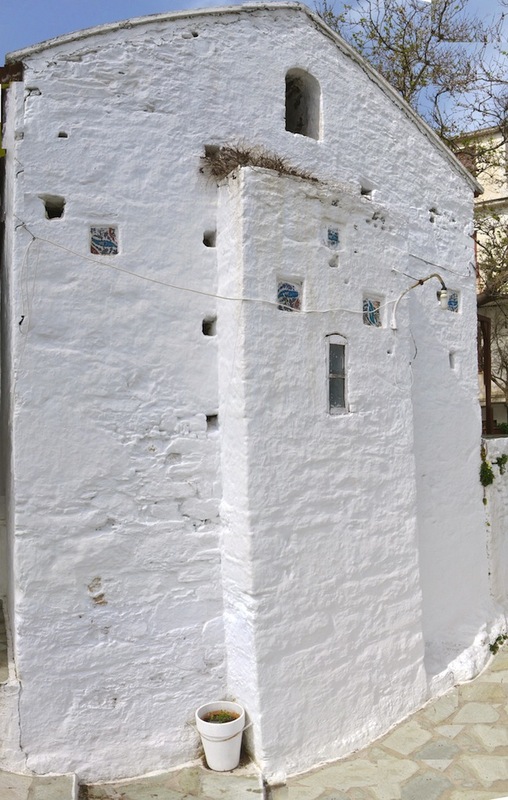 The sanctuary is tripartite, appearing rectangular from the exterior, as in many churches of the neighbourhood of Christos. The iconostasis very old and worn. One half is carved while the other half painted with colorful flowers and resembles the iconostasis of the local post-Byzantine churches of Ag. Demetriou and Ag. Giorgou. On the north and south walls are painted some saints, shown in frontal, full body poses and dressed in archaic clothing. The western wall holds an interesting depiction of the second coming, scenes of heaven and hell. In the last one you can see the forms with the names Caiaphas, Herod, and others. On the same wall is the date 1734. The unknown Hagiografos is obviously practiced in the classical style, prefers deep colors and gives his forms strong modeling and elegance differentiating them from the monastic style of the post Byzantine era. The frescoes are fine examples of the post byzantine style with robust forms and clothing painted with fine brushes. 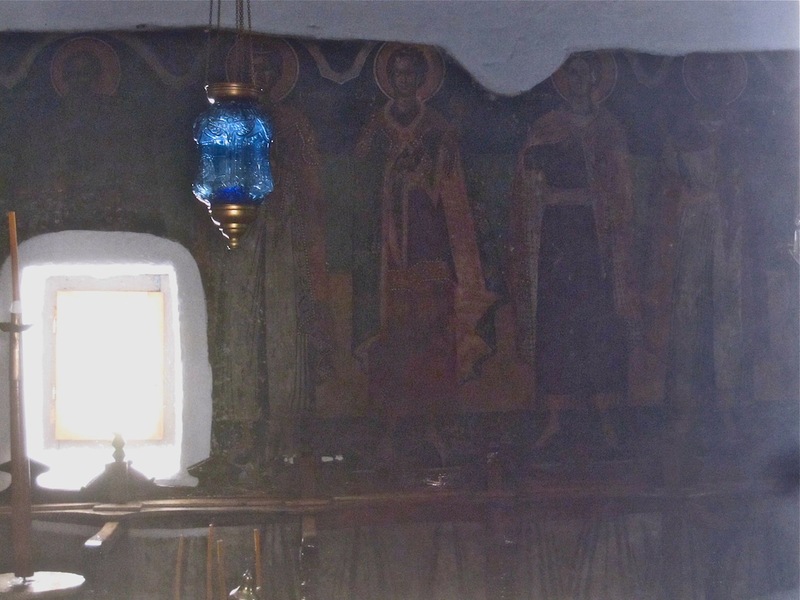 Βehind the iconostasis, hidden from view in the sanctuary, are the oldest frescoes which show the Holy Fathers with their characteristic dress. There are also frescoes of saints in circular motif on the underside of the arch in the sanctuary. The feast day of the Holy Apostles in 30 June. 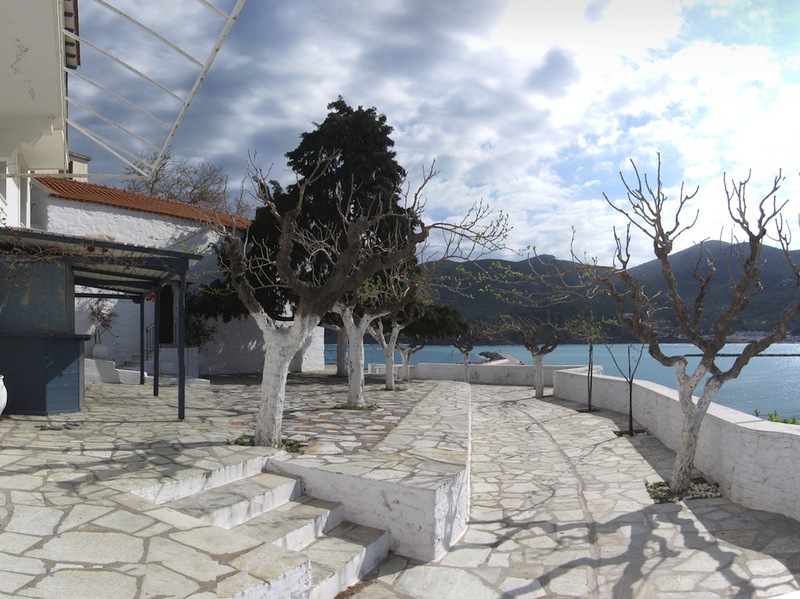 * The Temple of Athena was destroyed at least once in 208 BC while Skopelos (Peparethos) was among the protectorates of Philip V of Macedonia. During the First Macedonia War Philip’s enemies were the Romans allied with Attalus I (241-197 BCE) of Pergamon (a Greek kingdom in Asia Minor). According to Livy, “In 208 BC a combined fleet of thirty-five Pergamene and twenty-five Roman ships occupied, plundered and destroyed all the country round the island of Peparthethos”. The forces Philip V arrived from Thessaly and eventually drove the invaders away. The temple of Athena on the Vrachos was one of the victims of this Roman/ Pergamene incursion. 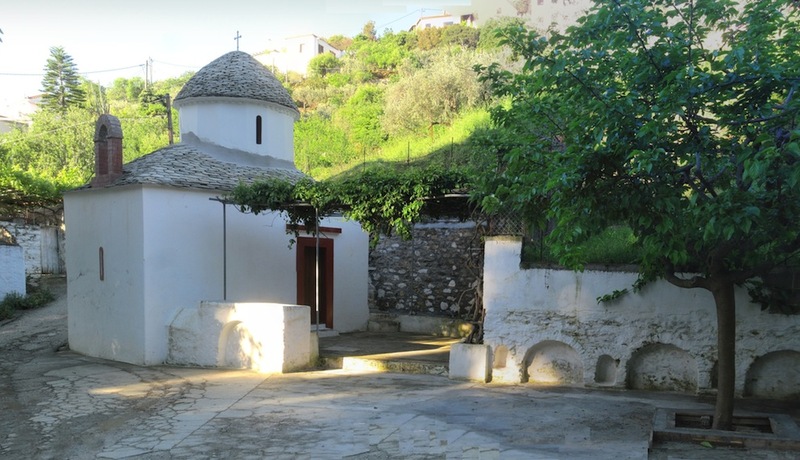 The church of Panagia Eleftherotria, more correctly “The Church of the Nativity of the Theotokos (Mother of God)” is in the area called Eleftherotria (near Orpheus and Panos’ Skopelos Cycling). The plaque over the front entrance says that it was finished in March 1871, though Sampson writes that the church was from the 17th century. Probably most unique to the casual viewer is the amount of fine china plastered into the walls. Also it has some interest architecturally because of the comparatively large size of the cylinder of the cupola which is supported inside the church by 4 columns. Most likely the craftsmen who constructed the church were from the mainland. 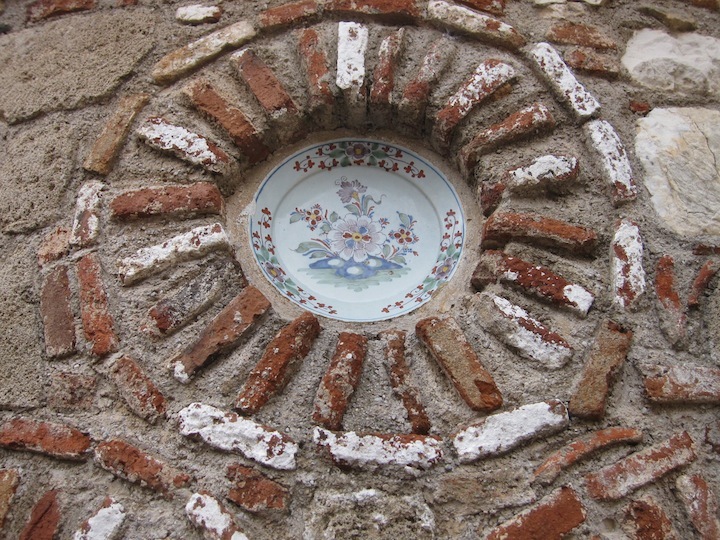 The brick work decorations are of Byzantine style and not found anywhere else in Skopelos. 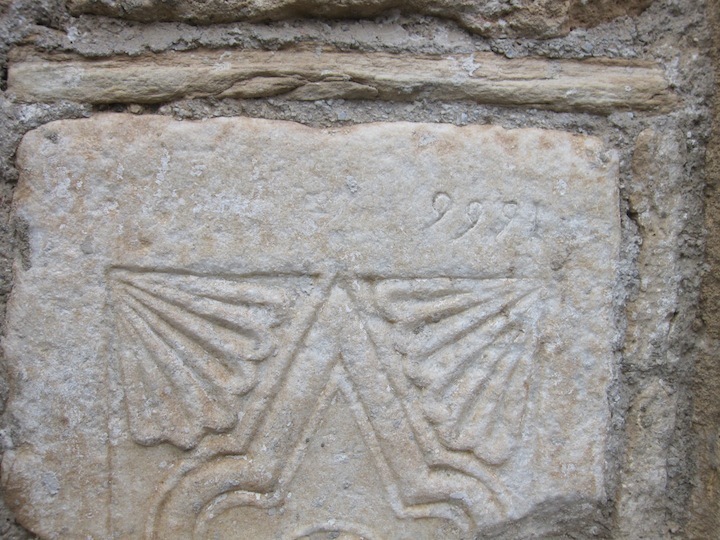 Note that much like Agios Michael, the walls of church have incorporated ancient and Byzantine carved pieces, but it is unclear if the location once held an Early Christian Byzantine church or whether the pieces were transferred from elsewhere. Also there is a red granite sarcophagus which is similar to the sarcophagi embedded in Ag. Michael and probably from the same workshop as those examples. At a later time (probably 1871?) the church needed repairs and other modifications, among which were windows on the north and south walls and a new doorway, as the older entrance was too small. 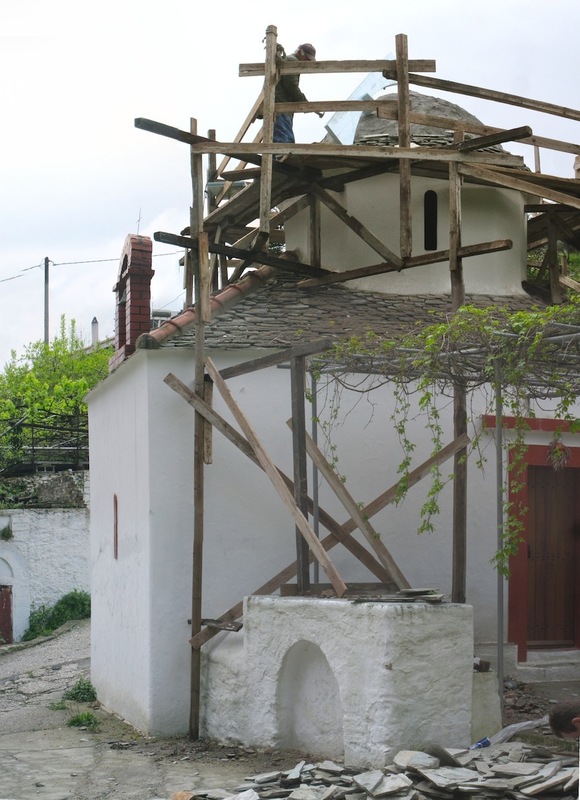 An even newer addition is the bell tower, built with bricks and roofed with plakas. 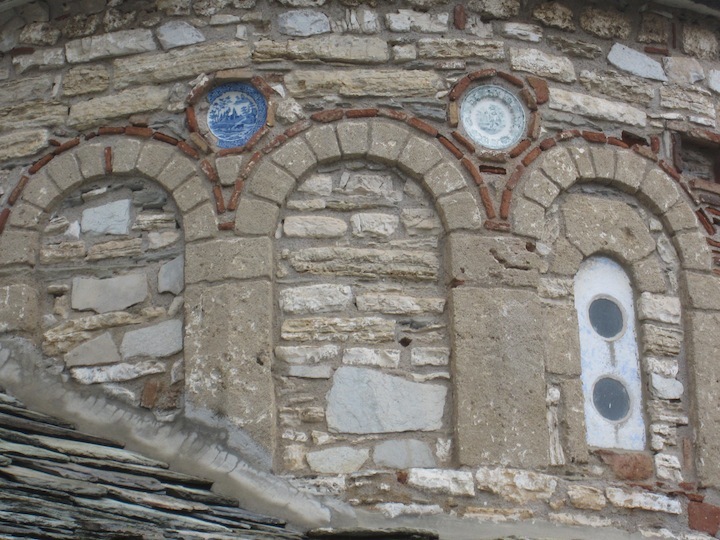 Byzantine Decoration interrupted by the addition of a newer window on the south wall. 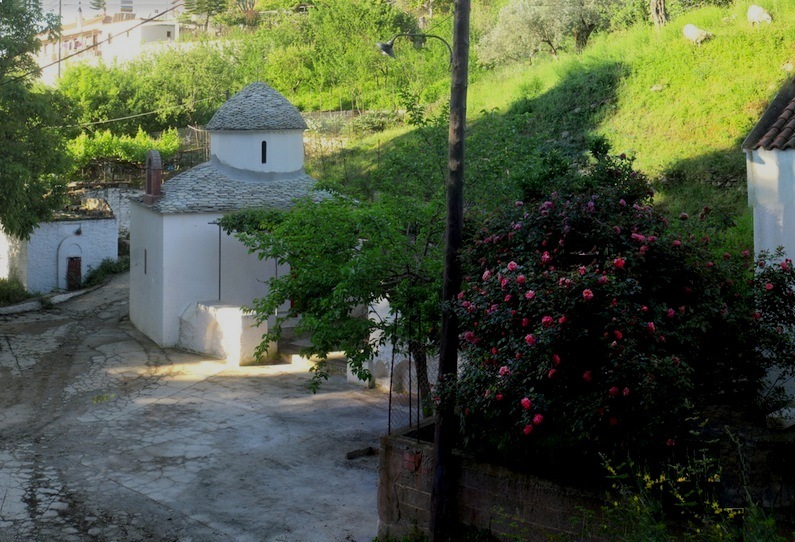 The Feast Day of Panagia Eleftherotria is 8 September. The liturgy on that day is attended by pregnant women who are praying for a safe and easy delivery. In this case the name Eleftherotria (from Eleftheria = liberty in Ancient and Modern Greek) means release. It is interesting that the Greeks had a goddess named Eileithyia who was the goddess of childbirth. Eileithyia is almost a homophone of Eleftheria. Byzantine marble motif inscribed with the date 1666. 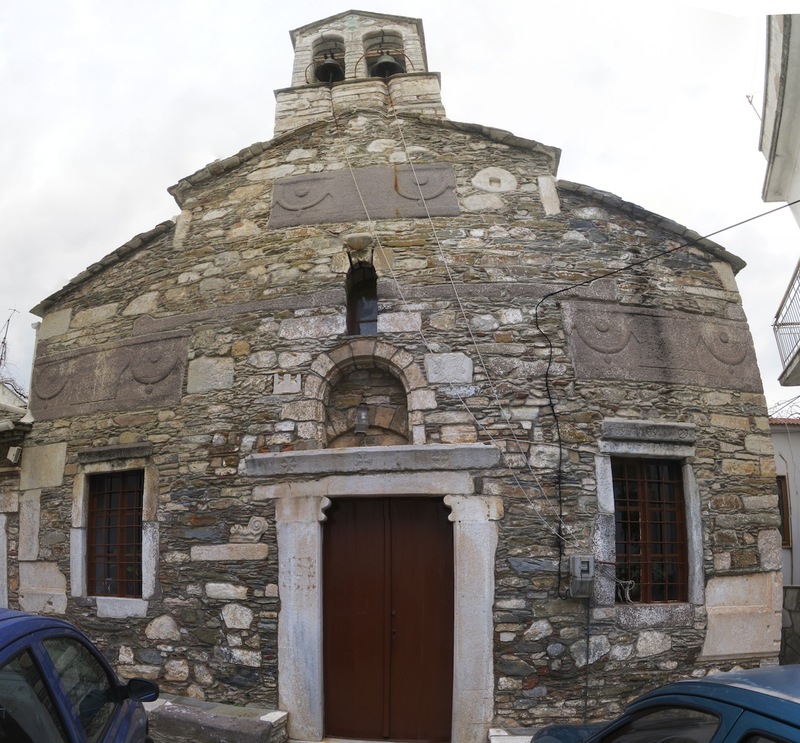 This is the church of Agios Michael (Μιχαήλ) Synadon. 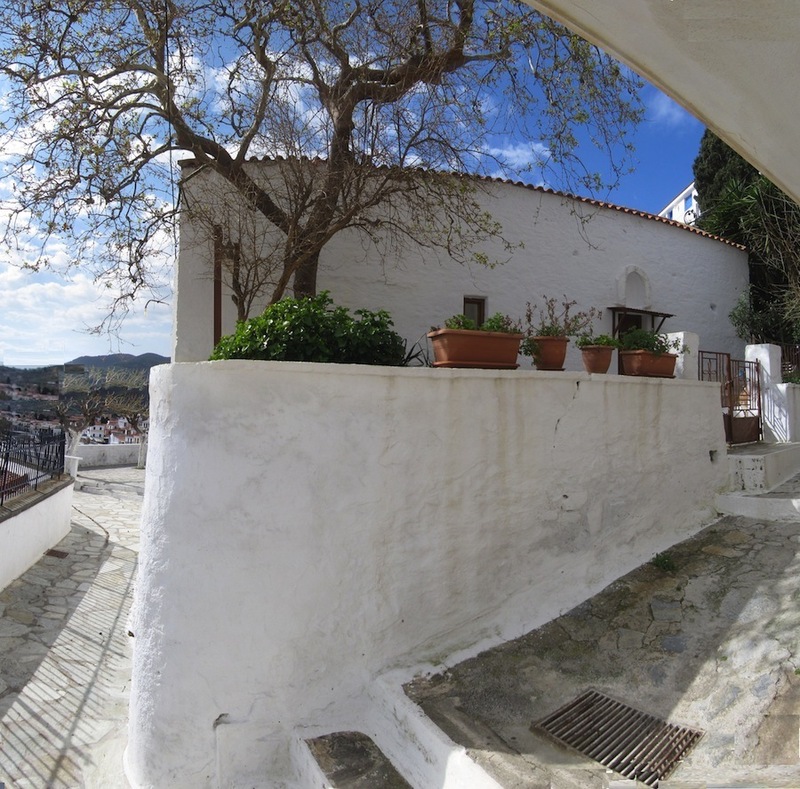 It is located just 100 meters from the port of Skopelos in the neighborhood of, well, Agios Michael. 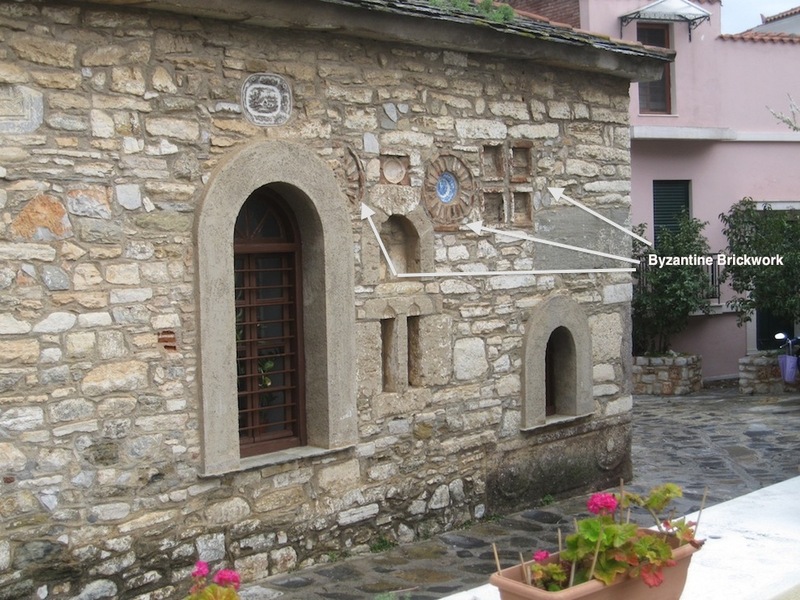 What is especially notable about the church are the ancient stones incorporated into the exterior walls of the church. Most obvious are the five red stone sarcophagi dated from the Roman period. Decorated with a bull and grape motif, four are positioned in the corners of the tetragonal building and one above the main entrance (narthex). 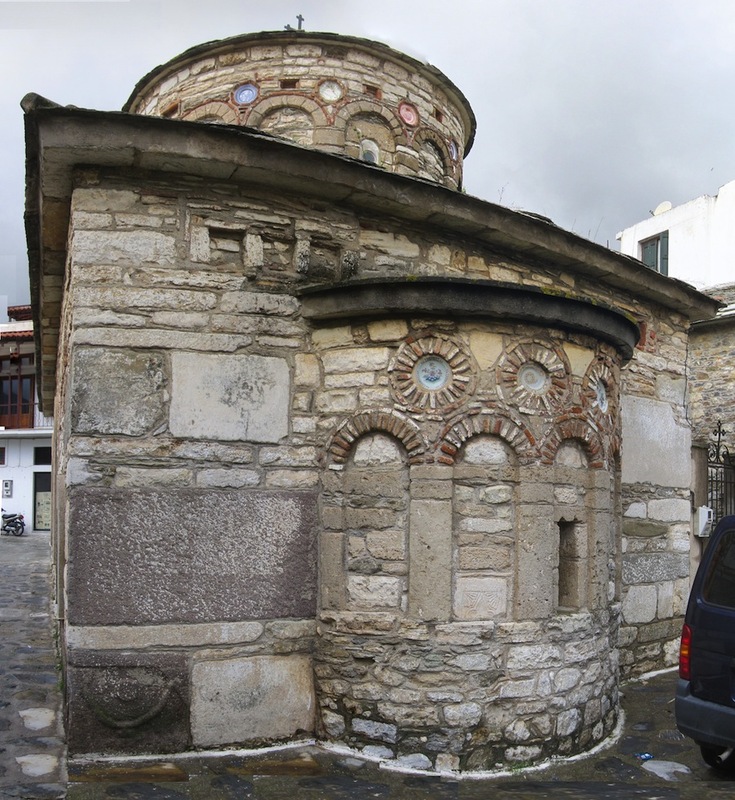 Centrally located in the back (apse) or eastern wall of the church is a Greek grave stele fragment dating from the 1st or 2nd century BCE. The stele is decorated with rosettes and inscribed with several names. Adamantios Sampson suggests that the white marble stone was re-inscribed after its first use. 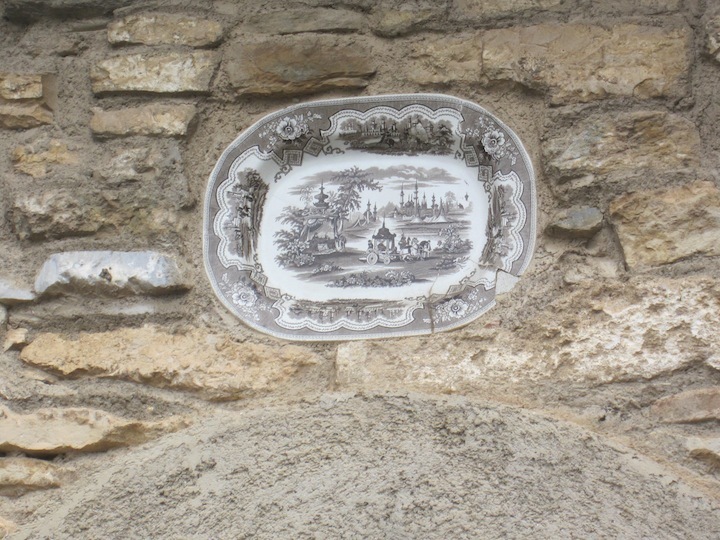 There are numerous other carved stone fragments from different periods embedded in the walls. It is certainly worth taking a look. Agios Michael was a bishop in the city of Synadon in Asia Minor (Anatolia). 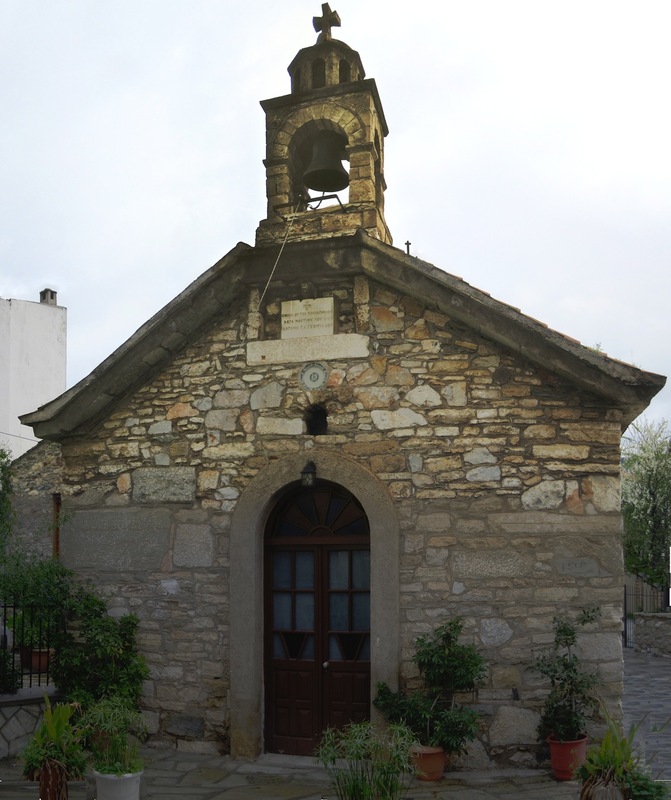 Love all the little churches in Greece, so much history and character. I miss that.